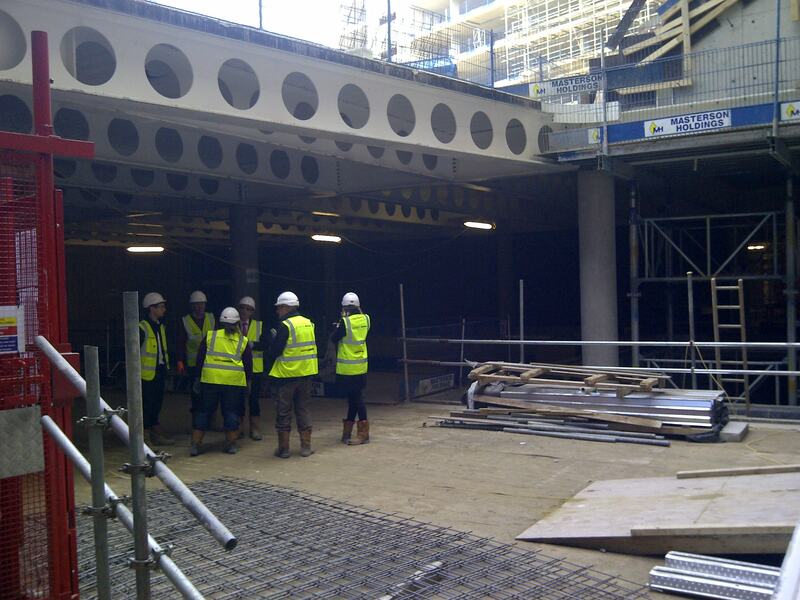 Along with other councillors I visited the development site at the bottom of Vanbrugh Hill – Greenwich Square – last week to see the new swimming pools and library being built there along with a new health centre, shops and 645 new homes. 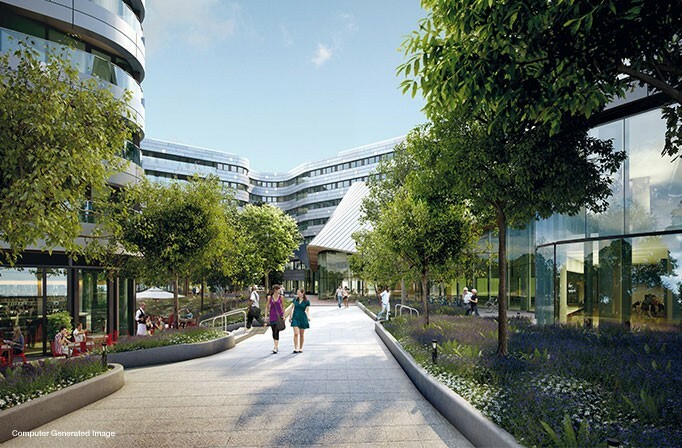 Like many developments that were conceived before the financial crash – plans were first drawn up for the site in 2006 and submitted to the council in 2007 – this one has been a long time coming. 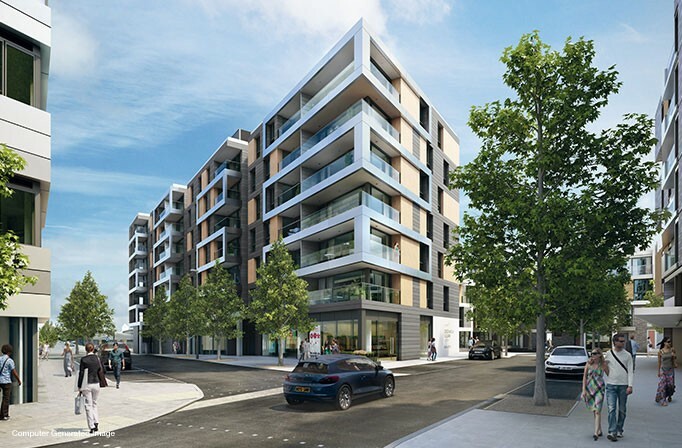 The development was given planning consent in 2008 but stalled when the developer First Base walked away in 2010, and after the incoming Government cut funds for affordable housing on the site it was difficult to make the development viable. But the plans were then modified, a new development consortium (Hadley Mace) was brought in in 2012 and work finally started on site later that year. The good news is that the scheme has been kept alive with only minor changes to Make Architects‘ original plans, and 150 of the new homes will be available to local people at genuinely affordable rents (not Boris Johnson’s definition of “affordable” – 80% of market rents). Make are a great architectural practice founded in 2004 by Ken Shuttleworth, who had formerly been a partner at Norman Foster’s firm, and I am glad their design has not been dumbed down. Local people could be forgiven for having forgotten the promise of the Greenwich Centre – a new library and leisure centre on the site, to replace East Greenwich Library and the Arches: the scheme has not been well publicised beyond its immediate neighbours so far. But work is now progressing rapidly and the new public building going up on the corner of Vanbrugh hill and Woolwich Road, containing the library, leisure centre and a council “contact centre” alongside a new public square, has been topped out. While there is some affection for the Arches and East Greenwich Library, I hope the new building can prove that public services can be as well-built in the twenty-first century as in the twentieth, and be easier to maintain and adapt to future demands. Elsewhere on the site the first 36 housing units – affordable homes to rent through L&Q housing association – are almost completed and are being handed over in April. A small Sainsbury’s on the site will open in July. 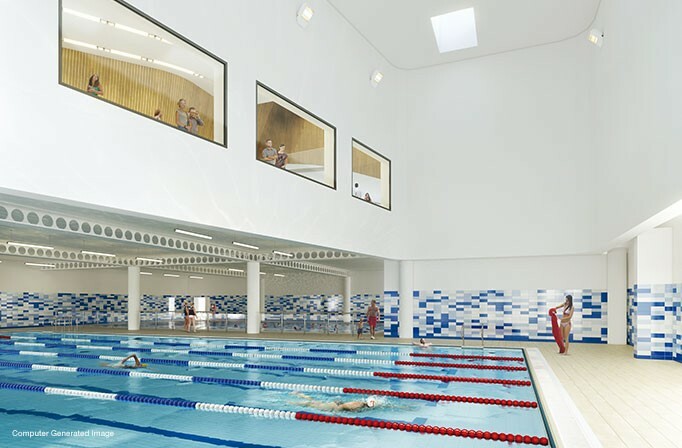 A gym, dance studio, 25-metre Fitness poll, a 20-metre learning pool, creche and an 820 square metre library – three times bigger than the current East Greenwich Library – should be handed over to the council in November 2014 and open by the end of March 2015. A new NHS health centre, which will replace the Vanbrugh Health centre operating at the southern end of the site, will also open upstairs from the library next spring, and all the housing on the site should be completed by 2018. Unlike many PFI developments, the council will have control of these buildings through a 999 year lease, and a seat on the management company that will own the freehold of the site. The council now needs to seek appropriate new uses for the (locally listed) Arches building and the East Greenwich library building (which is statutorily listed), which will be replaced in spring 2015 by these new facilities. I would be keen to hear local people’s thoughts about how they should find a sustainable future (Blackheath Library on Old Dover Road, which was refurbished and had its opening hours extended in 2010, won’t be affected). 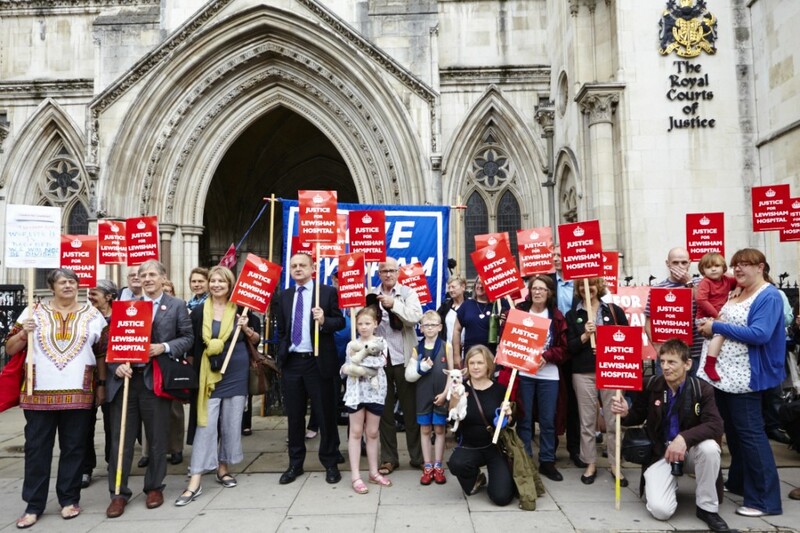 In 2013 proposals to savagely cut services at Lewisham Hospital – downgrading Maternity and A&E services and selling off a large chunk of land – were twice defeated by the High Court, which ruled that the Government was acting outside of its powers with its plans, thanks to an energetic community campaign. But damaging cuts to Lewisham may yet emerge by the back door, and this is a threat we need to remind voters of in the run up to the May elections. Clause 119, hastily tacked on to the coalition government’s Care Bill, will make it easier for Trust Special Administrators (TSAs) to close down hospital departments with little meaningful consultation on proposals until it’s too late. The clause was voted through on Tuesday evening (March 11th), opposed by Labour but with only six Conservatives and one Liberal Democrat MP voting against. As the Save Lewisham Hospital website reports: “The vote was lost in Parliament this evening – with Labour’s amendment of a strike out of the clause being voted down and with Lib Dem Paul Burstow withdrawing his support for his own amendment in weasly fashion at the last minute”. Some concessions have been made – GP-led Clinical Commissioning Groups (CCGs) will have more of say over hospital closures than the clause originally proposed – but it is now a lot easier for the government to close down hospital departments in the teeth of huge local opposition, as a good report on the OpenDemocracy website explains. If the new clause means that cuts to Lewisham are pushed through again, local Lib Dems and Conservatives will have a lot of explaining to do. 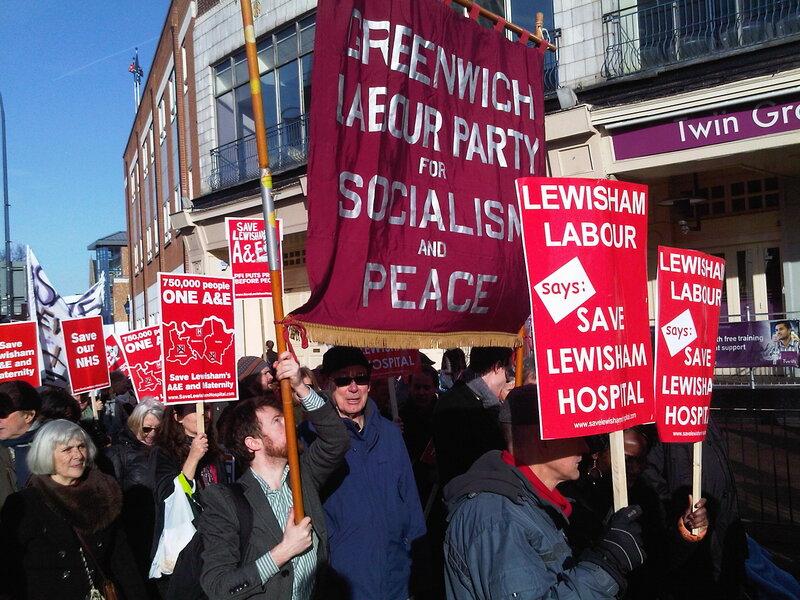 Great news about Lewisham Hospital – but what’s happening to GP services in Greenwich? Well done to the Save Lewisham Hospital campaign. Earlier this year they got the High Court to rule that Health Secretary Jeremy Hunt’s plan to downgrade Lewisham’s Accident and Emergency and Maternity services was unlawful. Now they have also faced down Hunt’s appeal against this High Court judgement. This means the Health Secretary must go back to the drawing board and properly listen to patients and doctors in reviewing hospital services in south-east London. See here for the press coverage of the victory on October 29th, in case you missed it. The campaign, which Labour in Lewisham has actively supported but not led, has been fantastic – with two large marches (one of them in the pouring rain) attracting 15,000 people each time to march down Lewisham High Street, and a number of smaller events. The campaign has captured the popular imagination across south London, and channelled the anger of local people into a David-against-Goliath legal victory that will go down in history. It has been claimed by some parties that Labour in Greenwich has not been as supportive of the save Lewisham Hospital Campaign as it could have been. Try telling that to the hundreds, if not thousands of people from Greenwich – many Labour Party members included – who have marched in the rain, collected signatures on petitions, fund-raised and organised meetings on the subject for the last two years. For people in Blackheath, Lewisham is as much their “local” NHS hospital as Queen Elizabeth Hospital is. As was feared, the Administrator in charge of our local hospitals since last autumn has now published his final recommendations for their future, without giving a reprieve to the accident and emergency department at Lewisham Hospital. The Trust Special Administrator (TSA) has just issued his final report which apart from some minor changes is the same as his draft proposals published before Christmas (see www.tsa.nhs.uk/document-downloads). Everyone is concerned that downgrading the A&E department at Lewisham to an “Urgent Care” unit will place too much pressure on the A&E departments at Queen Elizabeth Hospital in Woolwich, and other hospitals. This is a particular concern for areas like Blackheath, which regard Lewisham as their local hospital as much as QEH. The wisdom of this is even more questionable as millions of pounds have just been spent improving and expanding Lewisham’s A&E department. Despite the driving rain, an estimated 15,000 people marched through Lewisham last Saturday to express concern about the Trust Special Administrator’s proposals for hospitals in south-east London. Along with many other people from Greenwich, I was proud to be among them. Is it back to the 1990s? Sitting in Blackheath Halls for the recording of BBC Radio 4’s Any Questions two weeks ago, I realised how reminiscent of a recent decade our politics is becoming. No, not the 1980s (even if Michael Heseltine, Chris Patten, Lord McAlpine and several other 1980s political figures have featured heavily in the news media recently, for a variety of reasons). It is the 1990s that seem to have started replaying. The John Major Government of 1992-1997, with its limited ambitions, sluggish economic growth, splits over Europe, Hospital closures, by-election disasters, and petty and regressive measures to curb benefit entitlements, seem eerily similar to the current Government’s travails. It is too simplistic to label the current Government Thatcherite – I think Majorite is much more spot-on. I was proud to attend two events in the last few days to celebrate the NHS and stand up for it against the onslaught of the Tory-led Government’s Health and Social Care Bill. 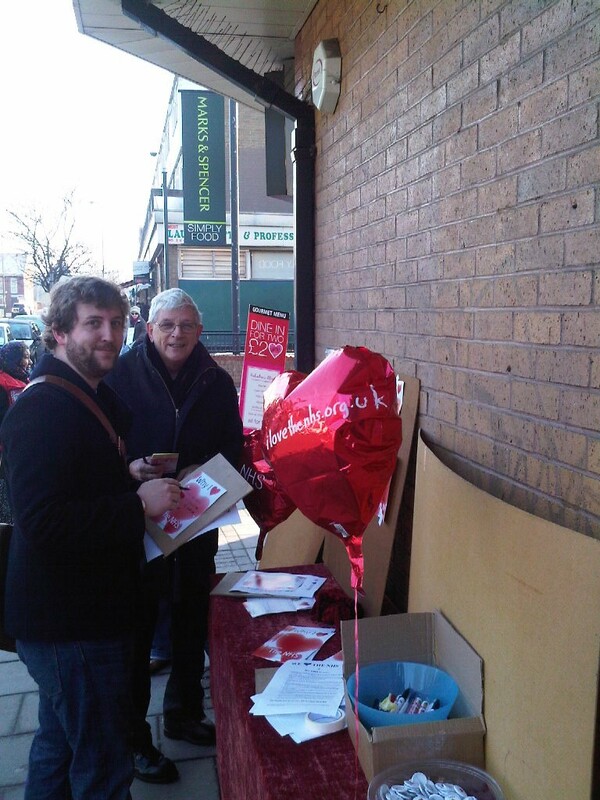 On Saturday morning Labour held a street stall outside M&S on Old Dover Road, getting messages of support for the campaign against the Bill. 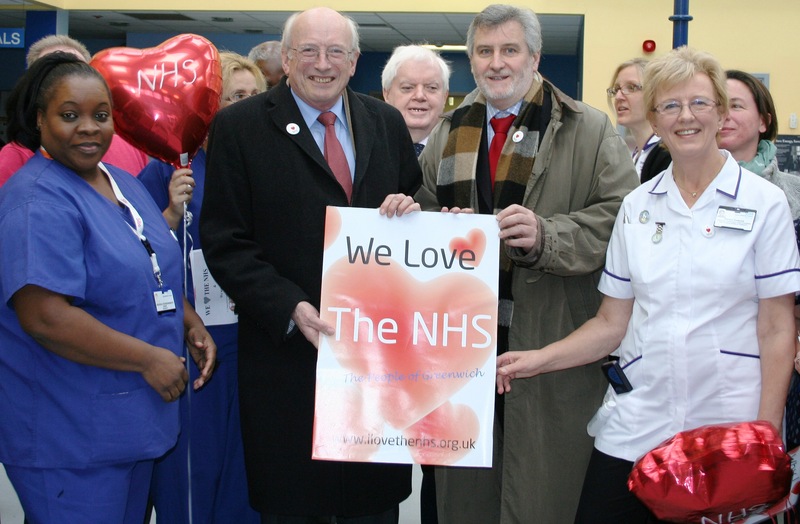 There was a slightly more formal event at Queen Elizabeth Hospital on Tuesday (Valentine’s Day), where the staff were presented with a Valentine’s card by local MPs Clive Efford and Nick Raynsford, and a big crowd of wellwishers, to show how much the NHS is valued by local people, as well as their MPs.